After months of waiting, Microsoft has finally demonstrated a fully working version of Windows 8, on machines powered by ARM processors. Microsoft has determined to make Windows 8 mobile-friendly and touch-friendly with complete overhaul of user interface and support for ARM processor, which powers most of the mobile devices including tablets and slates that produced in the world today. 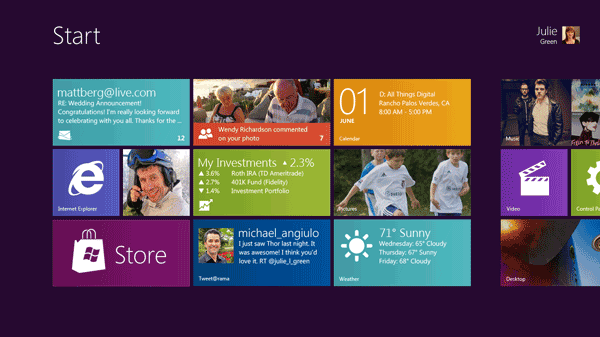 Though several early builds of Windows 8, none managed to reveal clear picture of new Windows 8 user interface. Bits of indicators that lead to belief that Windows 8 UI will take a lot of cue from Metro UI of Windows Phone 7, but probably nobody expects such a drastic change. In fact, Windows 8 introduces a tile-based touchscreen-optimized user interface as skin, including a completely new Start screen, which replaces the traditional Windows Start Menu. The new Start screen provides at a glance view to view live information and easy shortcut to launch applications. The lock screen is also enhanced to display notifications. Change also coming to how multitasking work on Windows 8. The new multitasking interface is pane-based. To switch to an app running in background, user just need to swipe in a live app to the center of screen from the side. All background apps appear to reside on the side of screen. Windows 8 also likely to include a Windows App Store, and IE10. The new immersive user interface of Windows 8 will be the standard core, and be applied no matter where the OS is installed. You get the same UI on desktop PC computer, laptop, notebook computer, netbook, slate or tablet running Windows 8. When users are able to run older Windows applications, the new tile-based interface will disappear, and users will find themselves back in the traditional Windows desktop environment. Microsoft Windows unit President Steven Sinofsky also talked about Windows 8 on stage during All Things Digital D9 conference on June 1. He confirmed that software applications designed for Intel-based Windows won’t run ARM-based apps, though the restriction probably won’t applied on new apps based on web standards. That confirms what Intel revealed earlier on, that though Windows 8 is supporting ARM processor, current Windows programs won’t run in machine powered by ARM chip. For an app to work cross-platform, an emulator or translator has to present, but Microsoft is not going to provide that. Across the globe, Mike Angiulo, Corporate Vice President of Windows Planning, Hardware and PC Ecosystem division at Microsoft, also held technical demonstration during Computex show on June 2, to demonstrate Windows 8 to hardware partners. Windows 8, apparently of build 7985, is installed on variety of machine powered with Intel x86/x64 and ARM-based chips, including a single-core 1.2GHz Qualcomm Snapdragon, a dual-core TI OMAP 4430 and a quad-core NVIDIA Kal-El notebook. If you have no time for half an hour video, here’s a compressed 5-minute version prepared by Microsoft for the press, which shows all the highlights of Windows 8 features and capability. During the show, Mike Angiulo also confirmed that Windows 8 will have the same or lower system requirements as Windows 7, allowing most computers to upgrade to Windows 8. OEM partners will also switch to OEM Activation 3.0 (OA3) for Windows 8. Additional video clip of Microsoft Keynote at Computex 2011 in Taipei, Taiwan, which more geared towards partners of Microsoft. As expected, the keynote was presented by Steve Guggenheimer, Corporate Vice President, Original Equipment Manufacturer Division of Microsoft, and provided interesting insights on what Microsoft going to do with Windows platform. Microsoft promised to reveal more details on Windows 8 during the BUILD developers’ conference during September 13 – 16, 2011 in Anahein, California. Previously, the conference was always known as Professional Developers Conferences (PDC).